Chiefs John Bradner, left, and Mario Lattanzio report to the Albany council Wednesday. 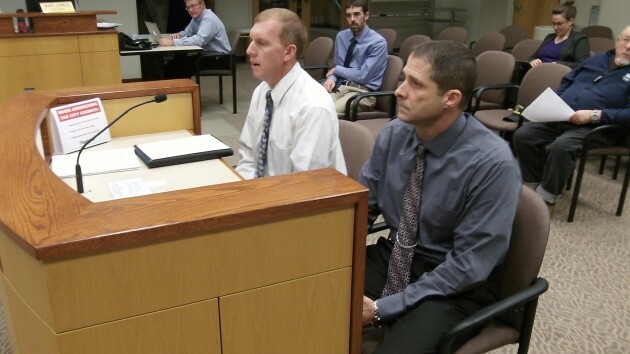 Separate city review committees picked the Portland-area firm from among several that had submitted proposals for the two projects, Fire Chief John Bradner and Police Chief Mario Lattanzio reported to the city council Wdnesday night. Now, as the next step, the city staff will negotiate a contract with the firm and submit it to the council for approval. The review committees met with the competing firms and studied their written proposals as well as their suggested designs. Bradner cited Mackenzie’s experience in designing such buildings. “They knew what they were doing,” he said. Councilman Floyd Collins said the designs will have to be refined and the drawings — on display at the Albany Public Library for a week each in October — did not necessarily show the final version of each building. Collins also pointed out that the city paid nothing for the work done by the firms that presented their proposals and drawings. The council will get to act on the final plans for each building, probably in February, in advance of a planned May election on a bond issue to pay for the projects. 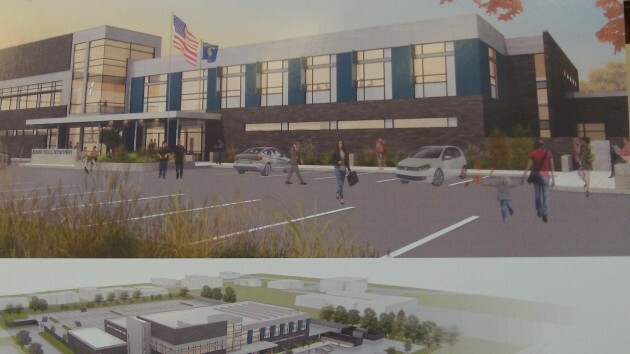 Mackenzie’s preliminary estimates were $13.9 million for the police station and just under $8 million for the fire hall. Its police estimate was the highest in the competition. For the fire hall replacement, it was about in the middle of the range of costs. Mackenzie’s idea of Albany’s new police department. 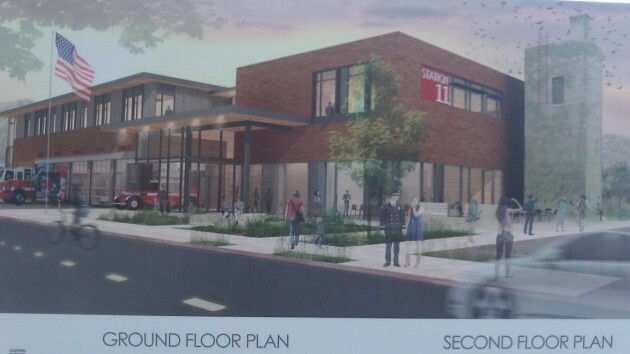 The company’s vision of the new downtown fire station. I recognize the need for the new fire and police buildings. And I appreciate having access to the conceptual drawings. But the May 2015 measure will probably be a referendum on what it will do to each taxpayer’s wallet. If voters in Albany are not willing to fork over a small tax amount for needed education buildings at LBCC, what makes the city think those same voters will fork over a tax amount that is about twice as much for needed public safety buildings? Look at your tax statement for evidence of the tax burden (LBCC Bonds vs. Albany City Bonds). The city could reduce the risk by submitting two separate measures and let voters decide the merits of each building. And the city could reduce the risk by committing as much CARA money as possible. If that means getting voters involved with a substantial change to the CARA Plan, so be it. And the city could reduce the risk by committing as much Pepsi money as possible. If that means upsetting the AMEDC and the chamber of commerce, so be it. We’re dealing with finite amounts of money and an infinite list of priorities. Someone has to sacrifice, and the first choice shouldn’t be the voter/taxpayer. But I suspect the city will not do these common sense things. They appear to want to saddle most of the cost of this measure on the backs of taxpayers. This will preserve most of the CARA and Pepsi money for pet projects. The city wants to have their cake and eat it too. Voters are not stupid. They recognize the game the city is playing. Unfortunately, the city’s disregard for the voter/taxpayer will probably, once again, shoot down both of the needed public safety buildings. It’s sad, really. Well, trying to justify the unjustifiable is not a good response. If the Pepsi money was supposed to make up for the economic loss, how do you rationalize expenditures that had nothing to do with mitigating economic loss? Ex: sewer rate offset, LID loans, East Thornton Lake Natural Area. I could go on and on with more examples. And the county and LBCC might object if the city used CARA dollars for police and fire buildings? When did the city ever ask for permission from the other taxing districts to siphon funds away? Answer – never. The reality is a majority of the projects and dollars identified in the CARA Plan are already pegged for “public’ expenditures. In other words, projects with zero tax increment. The city could easily re-target those dollars to the fire and police buildings through the substantial change process outlined in the Plan. All it takes is voter approval. Does anyone seriously think the voters-taxpayers would vote NO on such a choice? Of course not. And given the projects and dollars in current Plan, on what basis would the taxing districts object if the voters changed the Plan to identify police and fire? Answer – there is no basis. Please don’t defend the indefensible. Who speaks for the voter-taxpayer on these issues? Clearly not the Mayor, Clearly not the Council. And apparently not you. I thought the Pepsi money was to reimburse the City for improvements it had made to the “infrastructure” in anticipation of the Gatorade plant. Similar to the Lowes/Oak St. “improvements”.